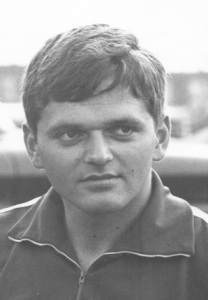 Don Domansky represented Canada at two Summer Olympics (1968 and 1976), two British Commonwealth Games (1966 and 1970) and two Pan Am Games in 1967 and 1975 in the 400 metres and the 4×400 metre relay. He won medals at the British Commonwealth Games (silver 1966 4×400 metre relay, bronze in 1966 400 metres, medals at the Pan Am Games (silver in 1975 4×400 metre relay, bronze in 1967 400 metres) and achieved a 4th in the 4×400 metres in the Olympics in 1976. As member of the UCLA (University of California, Los Angeles) track team, Don was a team NCAA champion, 4×400 metre NCAA champion, selected to the All-American team, and was a world record holder in the 440 yard relay in 1966. He held the Canadian individual open record in the 400 metres from 1967 to 1977 and helped set the Canadian 4×400 metre record (3:02.64) in 1976 which still stands today. Track and Field News ranked him 3rd in the world in the 400 metres in 1967. His fastest performance was a 44.3 400 metre relay split in the 1966 British Commonwealth Games. On a provincial level, Don was 200 metre OFSAA champion, was head coach of the Ontario Track and Field Team at the Canada Games, and served as Vice-President of the Ontario Track and Field Association. In Thunder Bay, Don helped build a competitive indoor track and a state of the art outdoor track for the community.